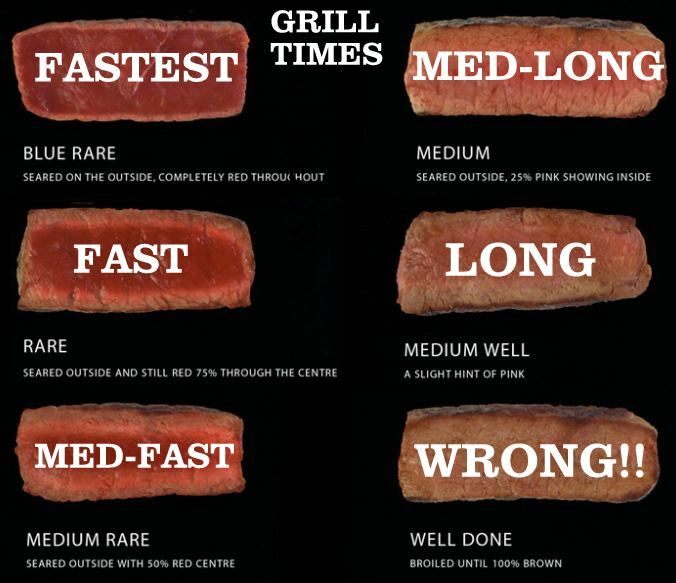 I would always love when someone would ask for their steak Extra Well Done! I would always respond with a “burnt” and they would say no Extra Well Done and I would say, If well done is fully cooked than “Extra Well Done” is “Burnt”. The conversation would usually stop there. Dumbass! I usually like my burgers cooked a little more too. I just think its a crime to get any steak well done. It cooks all of the flavor out of it. I bought a tri-tip and brought it over to my husband’s while we were dating. I told him that the temperature to cook it at should be no higher than 350. He was grilling it. I spent $13 on this small tri-tip. I was busy in the kitchen mixing drinks and when I went outside, the temperature on the grill thermometer was 525 degrees. I screamed and lifted the lid to find on the grill the biggest piece of charcoal that I have ever seen. He told me he likes it that way. Over the years he has perfected giving me anything from the grill (red meat because when he cooked the chicken it was raw) medium rare! Like Jeni – I do like my burgers cooked more than my steaks! Nice chart Ross! You’re right to each their own, but I hope you like dry steaks that typically take 20-30 min to cook… and I hope to whatever god you worship that you don’t complain repeatedly about the amount of time its taking as the cooks slave over the grill, watching your piece of meat burn as your server returns to your table to refill your free waters. Once had a chef refuse to cook my mum’s steak ‘well done’, when she insisted she only liked it like that and wouldn’t want it if it had any blood, he ignored her, left it dripping and then came out of the kitchen to lecture her. Way to embarrass my mum – and lose a tip. If that is how she wants it, and she’s paying for it and prepared to wait, then cook it that way! I have to concur that if your paying for it get it the way you want it, it maybe inconvenient for the server or cook but hey that is what they are there for itsn’t ? when I order something I expect it done like I Ordered otherwise I won’t come back, and yes I am very patient. the only complaint I ever had was the time I went to a italian resturant and we ordered for 3 since my mother in law came and you get sourdough bread and these are small cute little loaves(definitly a one person loaf) and they gave us one at a time, I mean three meals three loaves right? nope we had to keep bugging the poor waitress to bring us bread. I mean they could at least say one meal one loaf per meal and if they are having problems with people leaving perfectly good bread why don’t they just charge for extra bread? anyway the meal was good the service good. I tipped the waitress a little extra for the extra work of bringing bread, should of made the manager pay for it. If it ain’t still mooing it’s overcooked. Rare to Med-Rare all the way, and that’s how our kids have it too, in fact they complain if I get distracted and it’s not pink enough, as well they should – but then they shouldn’t distract me I guess…! I’m one of those it’s wrong people. I only order steaks out when I know the folks and KNOW they will be nice about it. I also have it butterflied so the rest of the med rare table doesn’t ax me. hahaha…. product of almost dying on bad meat–just can’t do undone meat. I know the facts, but it is a psycho thing.